Most of us like to dictate when and how often we use the internet, but one media company is now considering placing limitations on that use. Any guesses on just who that company is? Sure, that was an easy one: Comcast. David Cohen, executive vice president of Comcast, says the company will likely have a “usage-based billing model rolled out across its footprint” in the next five years, CNN reports. 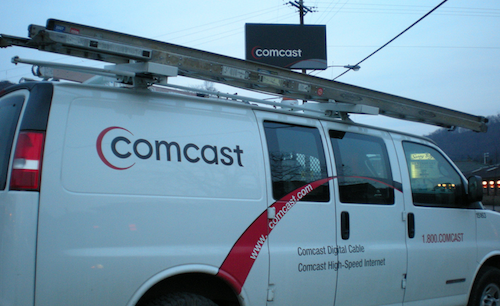 When the plan is implemented Comcast customers, would only be allowed to use a certain amount of data before incurring additional charges for exceeding their data limits. Cohen says the company plans to set the limit at a level where most consumers wouldn’t be affected. Possible limits discussed include 350 gigabytes or 500 gigabytes; enough data to allow consumer to download or stream between 70 and 125 HD movies, CNN reports. Comcast has already begun testing (and expanding) “data thresholds” of 300 GB in some markets. In those areas, consumers who go over their allotment are charged $10 for each additional 50 GB used. Given the potential marriage between Comcast and Time Warner Cable, the plan for data caps could have a significant impact on most Americans. As Consumerist reported in April, a whopping 78% of Americans could find themselves living under the new normal of limited home broadband if the merger is granted and Comcast continues to expand data caps. While the data cap might not be welcomed by consumers, it might be by officials at TWC. The company tried to implement “metered bandwidth” back in 2009 but dropped the plan when there was major opposition. Since then, the company has allowed customers to opt-in to accept restrictive caps in exchange for a tiny monthly discount, but even that plan has all but failed. While most of us don’t have to deal with data usage limits for our broadband just yet, it is a reality for many rural communities. In February, we told you the story of a small Alaskan town that faces very restrictive data caps. One woman said she pays $100 a month for 25 GB of data. When she went over by 2 GB after watching a movie on Netflix her monthly bill doubled. In another instance, two roommates racked up a $3,500 overcharge in two weeks after allowing Dropbox to continuously sync their computers. Why don’t they just switch broadband providers, you ask? Well, they can’t. GCI, a communications company, has a monopoly and costs in the area aren’t likely to change anytime soon. With the possible merger and companies continually experimenting with caps, it’s more likely than ever before that Alaska is giving us a preview of the future of home broadband. Next Adventures In Babysitting: Which Cities Have The Highest-Paid Babysitters? Next Up: Adventures In Babysitting: Which Cities Have The Highest-Paid Babysitters?